"This is not a science fiction fantasy. 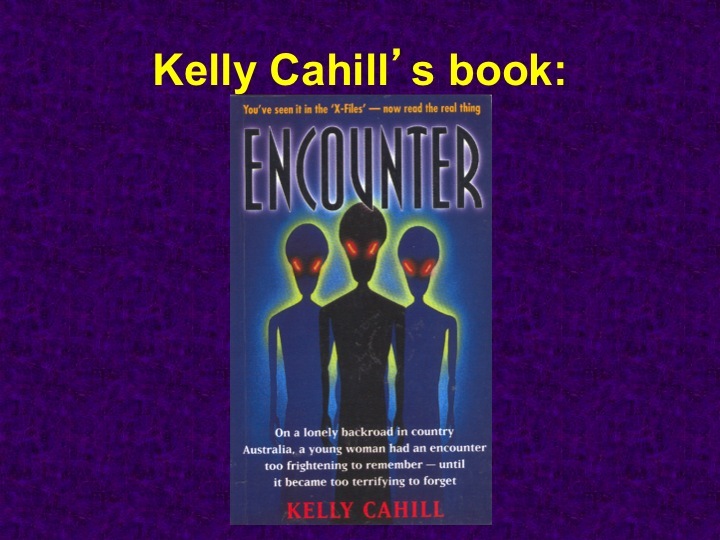 This is an Australian reality", states Kelly Cahill of her experiences and her odyssey into that vast milieu that is the UFO abduction phenomenon and the social phenomena that swells around it. The first episode of the new limited season science fiction series of “The X Files”, aired in late January 2016, had FBI agent Fox Mulder testing the knowledge of a new possible asset by asking him about Kelly Cahill. Here was “The X Files” utilising a real case. That exposure in a fictional TV programme watched by millions put the Kelly Cahill case back into the spotlight. Kelly had long since retreated from the spotlight. My last contact with her was when she sent me her personal files before moving overseas for a new life free of the attention that the UFO episode had drawn. Ultimately Kelly Cahill was the only witness to what may have been a multiple witnessed abduction milieu who emerged into the public eye. 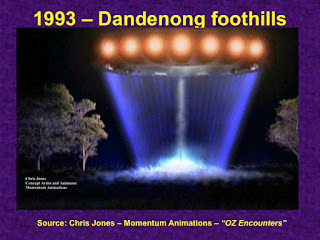 The case showed great promise suggesting that on 8 August 1993 at a location known as Eumemmerring Creek, Belgrave, in the Dandenong region near Melbourne, Victoria 3 apparently independent groups of people may have witnessed a UFO at very close quarters, encountering strange entities and experiencing abduction like episodes with apparent physical effects on witnesses and the apparent UFO close encounter site – ground traces which appeared to include a magnetic anomaly, unusual soil chemical profiles and possible surface damage. In all it seemed 6 people were involved – Kelly and her husband “Andrew” (Car 1), Jill (or Glenda depending on which account you read), Jane and her husband Bill (Car 2 – Kelly apparently observed this car, but was only aware of 2 people), and a single male (Car 3). In attempting to deal with the unraveling nightmare, Kelly tried to contact universities and aviation authorities, albeit with unsatisfactory results. The aviation authority gave her 2 UFO contact numbers, one in Victoria and mine in Sydney, New South Wales as part of the UFO Investigation Centre (UFOIC). Kelly was very dissatisfied with her attempts to receive assistance from the Victorian group, which seemed keen to only get details of her experience into their publication, and then dwelling on how extensive their files were and criticising other researchers. 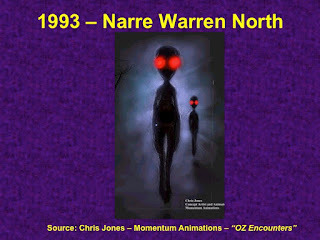 She then contacted me on October 4th, 1993, seeking assistance in understanding a bizarre experience she had near the outer Melbourne suburban housing estate of Narre Warren North, in the foothills of the Dandenongs, Victoria, between Belgrave and Fountain Gate, during the early hours of August 8th, 1993. The importance of this event lies in the fact that when Kelly contacted me she mentioned that apart from her husband with her in their car, she was aware of another car further down hill from their position which contained at least two people, a man and a woman. She paid little heed to them at the time as she and her husband's attention was taken up by a massive UFO that had apparently that had landed in the field opposite them. Because Kelly lived in Victoria and my preliminary assessment was that her experience warranted serious investigation from investigators and researchers closer to the locality than I was, I passed details of Kelly's experience onto John Auchettl of Phenomena Research Australia (PRA) and recommended Kelly contact him. PRA appeared to have conducted a detailed investigation of the incident which developed from a complex UFO close encounter, entity encounter and missing time milieu, to a incident that also involved other people unknown to Kelly and her husband. By November 17th, 1993, PRA's investigation managed to locate the man and woman apparently seen by Kelly that night. The couple were also accompanied by a girl friend that night, and this separate group were apparently able to take John Auchettl back to the encounter site, to a spot consistent with Kelly's location of them. 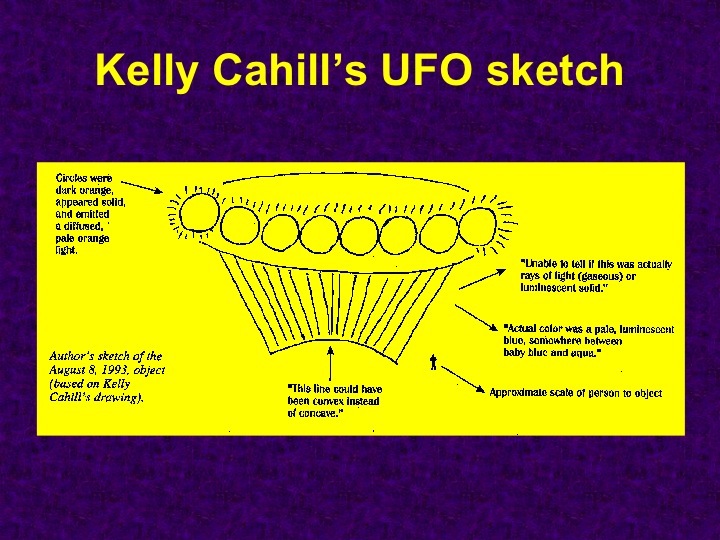 The group's drawings of the UFO and entities also closely coincide with those of Kelly. It is extremely significant that this independent confirmation of a Close Encounter of the third kind (CE3) and "missing time" milieu has occurred as it possibly represents a first, in that two groups of people unknown to each other have witnessed the same UFO encounter, entities and also experienced missing time, and each group has been available to competent and serious investigators and researchers. Perhaps for the first time independent witnesses have been able to provide information that enabled cross checking and correlations to reveal a striking degree of similar information, therefore possibly offering a compelling case for the reality of the strange events described. The ontological status of the events is further strengthened by the reported discovery of a range of apparently related physical traces, including ground traces, a magnetic anomaly and effects on some of the witnesses. Twenty years ago "The extraordinary abduction of Kelly Cahill" was the first chapter of my 1996 book "The OZ Files - the Australian UFO Story". "Rolling Stone" (Australian edition) ran that chapter as an excerpt in the magazine. 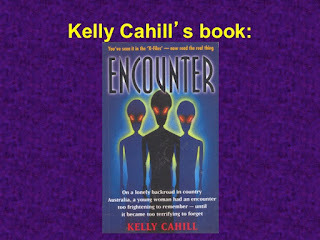 Later in the year (1996) Kelly's own book "Encounter" was published. I described the case in my 2005 book "Hair of the alien" as a lesson well learnt - "Trust no one" (to play on an “X-Files” mantra) if you want it done right. 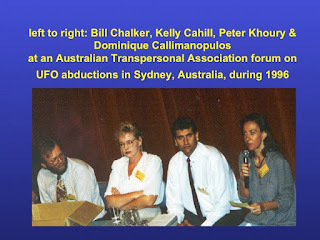 The Kelly Cahill case and the strange dynamics with the PRA group in Melbourne ensured I would focus myself on the Peter Khoury case and not let another group run with it and seemingly bury their data, in a manner similar to what happened to Kelly herself. Her persistence got her some limited case data from PRA (but far short of a detailed case file that gave context and detail). Despite being the person who facilitated John Auchettl/PRA’s involvement in Kelly's case in the first place I never did see their promised case data and detailed report, which would have assisted in analysis and assessment. Kelly Cahill's experience was an extraordinary lost opportunity. I came to regret my decision to involve PRA, but they were Victorian based and I was in New South Wales. PRA's decision to not make their data generally available was disappointing, but it was the dynamic that emerged in their investigation that disappointed me the most. 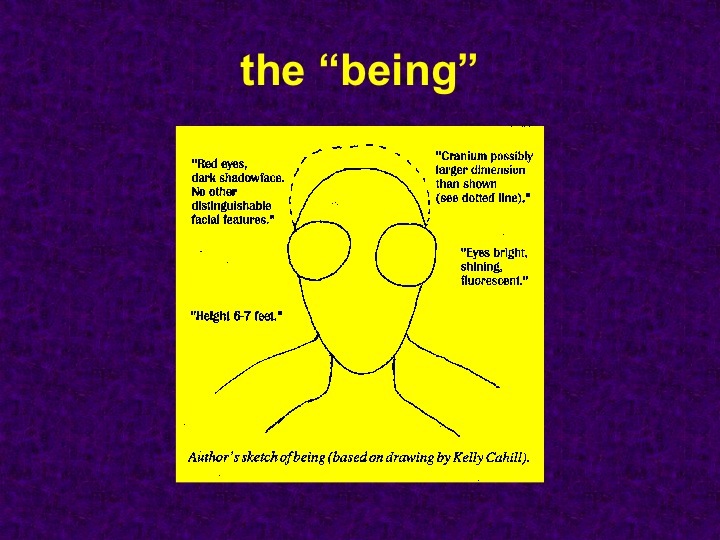 I am still impressed by the basics of Kelly Cahill’s experience. I am frustrated by the investigation dynamic, mainly PRA's investigation, so much so I determined never to pass a case onto them again. It was frustrating that such a promising case was caught up in a situation where the group involved chose not to make their data available. PRA specified witness problems and legal hassles as the key contributing factors that stopped their report emerging. They claimed that forced changes made the proposed end document unworkable. Maybe John Auchettl & PRA might now feel they can free up their case data on this intriguing case. Its only been 22 years? I've got no expectations nor do I wish to play their games again. Someone else's turn. In the absence of a detailed case file from PRA to examine I’ll summarise below various references that may help you navigate through this complex case. This will help you then navigate through the various on-line Internet references which vary tremendously in quality. My own initial account of the complex episode was the first to appear. 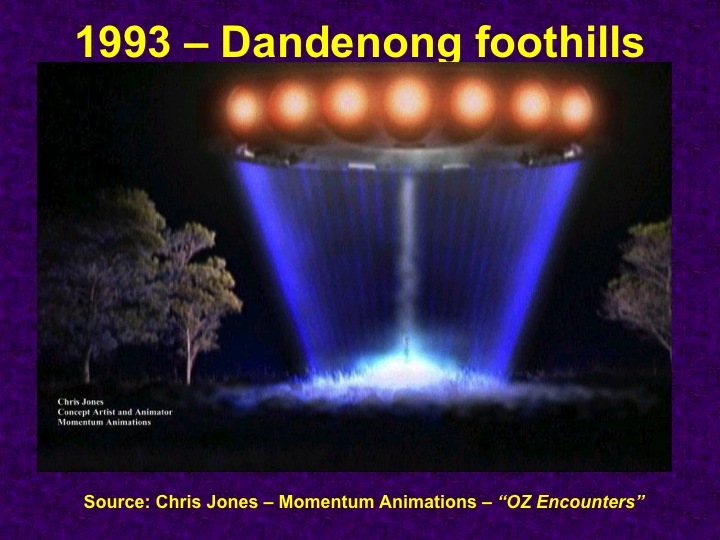 It was published in the Allen Hynek Center for UFO Studies (CUFOS) publication International UFO Reporter, September/October, 1994, in “An Extraordinary Encounter in the Dandenong Foothills”. “Kelly has gone on to write her own account of the experience and its difficult aftermath. In October 1994 John Auchettl and PRA, whose investigative thoroughness is to be commended, released a comprehensive report on the affair. In this emotionally explosive area it is easy for people to get caught up in less than satisfactory situations while they attempt to understand extraordinary experiences. I hope this event and the documentation that flows from it will be of some help to others in similar situations. “It should be noted that the above "comment" in the 1994 IUR report was prepared on the assumption that the "PRA comprehensive report on the affair" was about to be released. Despite nearly a decade passing, John Auchettl and PRA have not released their report other than a few fragments of information. “As the researcher responsible for passing Kelly Cahill onto PRA in the first place, principally because I am NSW based and the incident occurred in Victoria, I have to say now that that decision was, in hindsight, a mistake. “My comment in my 1994 IUR report: "John Auchettl and PRA, whose investigative thoroughness is to be commended", was based entirely on conversations with Auchettl and discussions with Kelly Cahill at the time (1993-1994), and in retrospect should have been qualified more accurately. While Auchettl & PRA may well have been thorough in their investigation, in reality there has been no way to absolutely verify this, because of their unwillingness to release their report and data on the case. PRA have offered some seemingly unusual and convoluted explanations for this lack of sharing. The “seemingly unusual and convoluted explanation” PRA provided for their report on the case revolved around 2 alleged versions of the report. The first one was scheduled for October 1994. John Auchettl was confidently advising of its imminent publication and that given I had facilitated his and PRA’s involvement in the case he had indicated I would be one of the first to receive the much anticipated report. Hence I made reference at the end of my IUR report that their report was published (to align with the publishing schedule of IUR) and part 2 of my report would focus on my analysis of the PRA report. Part 2 of my PRA never appeared because the PRA report was not released. What happened? John Auchettl and PRA were not particularly transparent on what seemed just a temporary bump on the road to publication release, albeit with Group 1 information substantially revised. While John Auchettl and PRA insisted they had not created the “witness problems”, I found myself drawn into this dynamic by Kelly Cahill. She rang me in a frantic state and agitated state begging me to contact John Auchettl to verify if her and her husband’s real names and location details were present in the PRA report about to be released. She told me that she had not given permission for their real details to be used and her husband was extremely angry about this development. Kelly had contacted John and found that this was apparently the case. She was asking me to talk with John to see what had happen and what could be done. I had an extended conversation with John in which it seemed very difficult to establish how John and PRA established they had permission to use Kelly and “Andrew’s” personal details in the report. Eventually it seemed that “permission” seemed to revolved around Kelly inadvertently using her real name and address details on the back of a single envelope in an abductee questionnaire PRA helped Kelly undertake with a pool of apparent abductees. I put to John that this hardly constituted getting clear and unambiguous permission to use the witness’s personal details. Apparently this led to PRA pulling the first version of the report. It remained unclear to me the true nature of the investigator/witness dynamic in this case given John and PRA’s lack of transparency on the matter. It seemed to me, correctly or incorrectly that things started to go downhill from there. What seemed to be a very promising and impressive investigation and report seemed to disappear into “the PRA bunker” with only very limited data emerging. The PRA Journal # 17 (March 1994) had John Auchettl reporting on yet another major issue. Allegedly the trio in Car 2 had signed a deal with German magazine interests who were now claiming copyright on all material related to their story. PRA sought legal clarification but in the end version 2 of the PRA report did not appear. As far as I can tell (as well as many other researchers also tried to determine) no German magazine ran any exclusive story on the experience of the occupants of Car 2. Nor did they come out with their own story. So in the end we have only the fragments that Kelly gleaned from John Auchettl and PRA and others gathered as well, such as in my own conversations with John. Now if the problems described by John and PRA were accurately described they would certainly have been acutely frustrating, particularly the latter media intervention. The witness issues could have been worked out I suspect without the need to gut the contents of the report, plus the reported physical data would have been independent of any of the witnesses and could have strongly supported the case, if they were allowed to have been fully reported in context. This was not to be and ultimately only John Auchettl and PRA can clarify that. A promising case, indeed a very striking case, was adrift and largely only standing on the testimony of one very determined witness – Kelly Cahill – and any supportive data and information that could be gleaned. These were largely anecdotal and only supported with some limited PRA physical data that lacked detailed context and documentation. I referred to the case in some detail in my 1996 book The OZ Files. 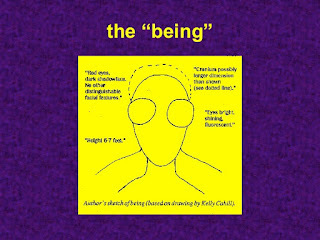 Kelly Cahill wrote her own book about the experience – Encounter – which was published later in 1996. See also UFOs: a Report on Australian Encounters by Keith Basterfield (1997), pgs. 123-128. Timothy Good provides a good summary in Unearthly Disclosure (2001), pgs. 51-66 based largely on Mark Birdsall’s interview with Kelly Cahill, which appeared as the article “The Red Dragon – The Abduction of Kelly Cahill”, UFO Magazine, March/April 1997. This article also described the contents of a letter apparently written by the wife of the man in Car 3. She mentioned I had failed to contact her after two messages were left. I found this particularly puzzling as my recordings of my answering service failed to reveal any calls that reflected that possibility. Needless to say if I had been aware that the wife of the Car 3 driver had actually called me I would have followed it as a very high priority. I did actually follow up all calls I had receive from Victoria that had not panned out on initial call backs but nothing led to anything related to the case. So that part of the letter was a big mystery to me. My summary “Kelly Cahill Abduction” appeared in The Encyclopedia of Extraterrestrial Encounters edited by Ronald Story (2001), pg. 291-293, also published as The Mammoth Encyclopedia of Extraterrestrial Encounters in the UK (2002). 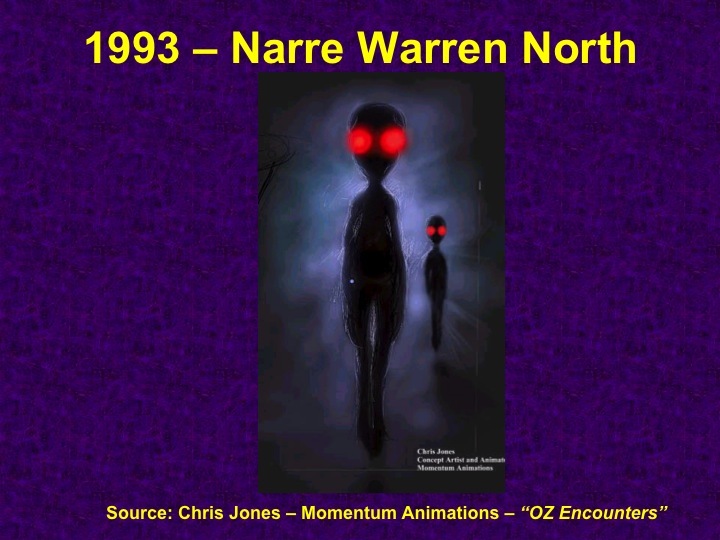 Phenomena Research Australia (PRA) are yet to publish their account in the broader public UFO literature despite the passage of more than 2 decades! 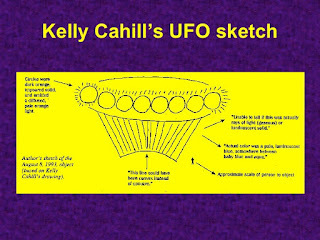 Along with Peter Khoury’s 1992 DNA case, Kelly Cahill’s case appears in The World’s Best UFO Cases compiled by MUFON UFO Journal editor Dwight Connelly (2004). Despite the lack of detailed PRA disclosure and his limited experience with them Connelly describes the PRA group as one of the most respected in the world, a claim I and many other researchers find very difficult to fathom. 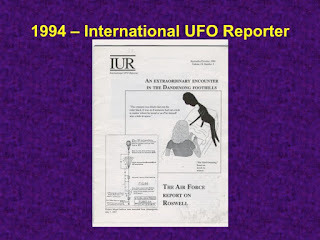 Here was an incident that might represent interesting evidence for a reality behind abduction reports. While it might not represent extraordinary evidence, once you are familiar with the full extent of the case, it might give pause to the argument that such tales are more about the human condition than they are about UFOs. Perhaps? Perhaps not? I found Kelly's account extraordinarily potent and compelling when I first heard it 2 months after it happened. I still find her story compelling. I’m less sure of the stories attributed to the other 2 car occupants and I am uncertain about the physical data reported by PRA simply because there was no way to confirm further details without PRA’s cooperation. As a physical scientist I would have loved to have examined the full data and reviewed it with the analysts involved. That was not possible as PRA did not allow those sorts of opportunities for peer review. John Auchettl surprised me once when he told me that he could not share the contact details of the scientist or analyst in a particular case we were discussing. The discussion followed on from his comments that while PRA were able to get technical data they lacked the resources to get it properly analysed and evaluated. I told him he was talking to a physical chemist – me, who could assist. He told me scientists don’t do that. I was dismayed. I replied scientists debate, argue and discuss data all the time – it's the core of peer review, the process that drives scientific dialogue and publication and research. The Kelly Cahill case was a striking missed opportunity to do exactly that. We are all the poorer for that. I am an advocate of careful, serious and thorough enquiry into such experiences. Until such investigations and support become the norm rather than the exception, abduction experiences will continue to be the province of a marginalised fringe controversy. Kelly and others like her deserve better than the polarised extremes we have now of uncritical belief and ignorant skepticism. Alien abductions may yet prove to be remarkable testimony to the eccentricities of man - that is, these experiences may spring from the realm of the hoaxer, the deluded and the alienated of our society. And yet the possibility that it may just be about something truly extraordinary demands we keep an open mind and keep the matter properly in question, until we have enough information to properly determine what is going on. Fortunately the number of intelligent and qualified people now looking into the UFO abduction mystery is growing. The victims of these experiences should not be unrealistically encouraged by advocates of alien presence, nor, at the other extreme, should they be ridiculed by the skeptical among us. They should be helped to confront the reality of their experiences, whether or not it is eventually found to be prosaic, profound, or extraordinary. Only time will tell, whether the search for answers will give us more insights into the human mind or into the UFO phenomenon. Could it be that it will do both? The UFO abduction mystery more than any other part of the UFO mystery brings us into direct confrontation with the human dimensions of the UFO problems. Here it is at its most intimate level with human beings. However the evidence for a physical reality behind UFO abductions is not as compelling as the so called mainstream UFO phenomenon, and yet we have the extraordinary problem that it is the abduction phenomenon that is now defining the UFO phenomenon. The UFO phenomenon itself has been abducted by the alien abduction phenomenon. Until we have gained a much greater certainty with the abduction data, it should not define our central understanding of the UFO mystery. We are a great deal more certain about the physical dimensions of the mainstream UFO phenomenon. Let us not abandon the firm foundations developed over decades for the extraordinary uncertainties and fantastic claims that dominate the field today. We need to learn from history. If we don't we will be condemned to relieve it and the UFO phenomenon will be condemned to stay in the marginalised fringe shadow it is now struggling to emerge from.